Magnets count. I got this as a free market and it now adorns my fridge door. It refers to the primary 88.5 WXPN signal in Philadelphia, the 88.7 WXPH signal in Harrisburg and the W259AU 99.7 signal also in Harrisburg. 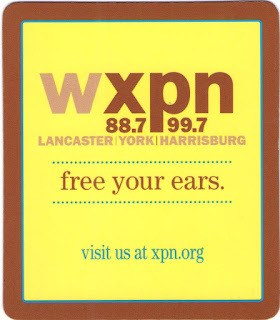 From 1993 to 2007, the WXPH call sign was used on 88.1 in Harrisburg, which is now WZXM. WXPN traded that facility to Four Rivers Community Broadcasting in return for 88.7 Middletown and W259AU that year. So presumably this magnet was made after 2007, but before they bought WNTI this year.